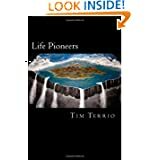 Tim Terrio: If you want to journey to a new world expect a few storms! This video is a small part of the latest educational class that's part of my new Wellness Program. If you want to learn more about setting up a plan and strategy email me at tterrio@terriotherapy.com. You can sit and wait for things to happen or you can make them happen! Get Informed. Get Moving. and most importantly to GET BETTER! To Thrive or Not to Thrive, that's up to you! !